Our Checkatrade feedback shows reliability, professionalism and integrity. A Mortice lock fits into a slot cut out of the door, with a key hole on either face of the door, and it's striking plate fits into a slot cut out of the frame. A mortice lock is deadlocking (i.e. can only be opened with a key). Strong locks are essential therefore always choose one which conforms to British Standards. Most home and contents insurers recommend a BS five lever mortice lock as a minimum. It is the most secure type of lock to get past it without a key means the door frame itself has to be broken. The more levers that a key has to work, the harder it is for anyone to pick the lock. Sash locks are deadlocks with a built in latch so they do require handles with them. The three lever mortice deadlock should be considered as the lowest form of security for a door, It is recommended that a 3 lever deadlock is replaced by a five lever BS3621 deadlock as soon as possible. A grade down from British Standard deadlocks is the standard five lever mortice deadlock offering moderate protection to main doors in your home, office or retail department. 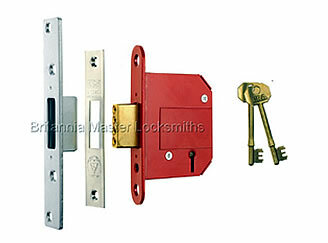 BS standard mortice deadlocks, conforming to British Standard number BS3621: 1998 for Thief Resistant Locks. 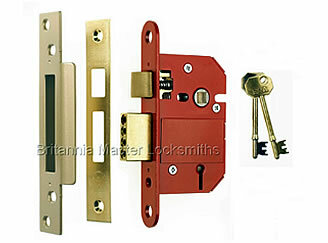 This is a high security mortice door lock that has been rigorously tested for burglar resistance. This type of door lock has a single 'dead' bolt that is locked and unlocked with a key. It is embedded in the door for extra strength, providing exceptional security and is specified by many insurance companies. It offers excellent protection against all common forms of attack including lock picking, force, drilling, manipulation and hacksaw. Back to "Name That Lock"